The Obama administration has had its share of ups and downs during the last five years when it comes to how the public sees it, but there’s been at least one constant on the positive side — the large number of Americans who have a favorable view of First Lady Michelle Obama. Since becoming first lady, Obama’s favorable ratings have never been lower than 62%, a far better showing than that of her husband, who was in the 70s during the early months of his presidency but whose favorability has mostly been in the 50s since summer 2010. But there’s one faction that isn’t enamored of Michelle Obama: Conservative Republicans see her unfavorably by a roughly two-to-one margin. But even there, she fares better than the president, whom conservative Republicans see unfavorably by 88% to 8%. She is also less of a lightning rod among them than Hillary Clinton was at the same point in her time at the White House. 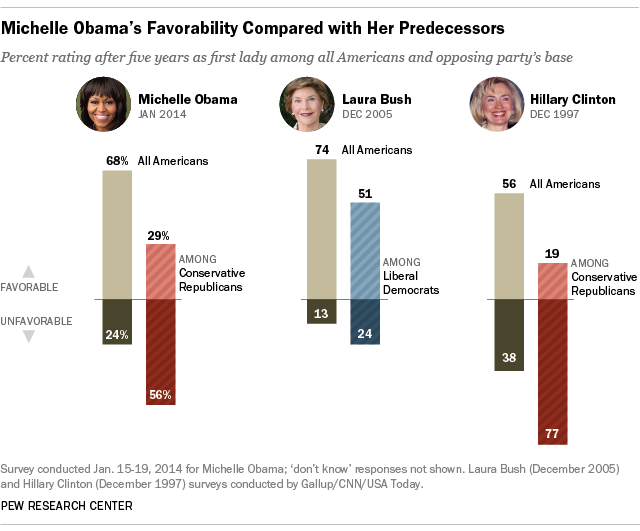 Because Michelle Obama’s unfavorable rating among conservative Republicans stood out, we looked back at other first ladies to see how they fared among the public, as well as those at the far end of the opposition party. To be sure, comparing first ladies and how the public views them is a tricky exercise because there is no “job description” for the position and each one has shaped her role in different ways and in different political environments. Michelle Obama has carved out a role probably somewhere between that of Hillary Clinton and Laura Bush — more visible than Bush, but less likely than Clinton to get directly involved in divisive issues. She has made the issue of reducing obesity among children through better diets and encouraging exercise one of her primary focuses.